She must be talking about her pompous husband. I haven't read a lot of Christie, but I enjoy her work. I would keep reading. Thanks for your earlier visit to The Busy Mom's Daily. Hope you have a nice weekend. Actually it's a lover who starting to realize she may not be as great as he thought. This is definitely a good one. Even better it's one I forget how much I enjoy until I reread it so it's always a pleasant surprise. Oh you're welcome! I'm always glad to meet another Agatha fan! This is one of my favorites but one I always forget about. I'd keep reading. There's no one quite like Dame Agatha Christie. No definitely not! I'm enjoying this one! I prefer the Sparkling Cyanide title myself! You know I'd never really thought of that as tragic for HER until you mentioned this but you're so right. It's definitely tragic that she needs so much affirmation and that that's all there is to her. Thanks for giving me a new perspective on a book I've read and reread! Ooh, those are definitely a captivating excerpts! I want to know more. Thanks for sharing...and for visiting my blog. This is a good one! I always enjoy it. Thanks for visiting! Sounds like an interesting Agatha Christie read. Have a lovely weekend. This is a particularly good one. Have a great weekend! 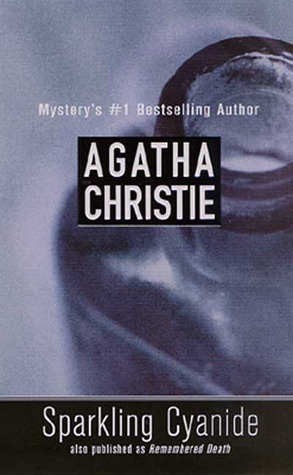 Agatha Christie's stories are always enjoyable. This one sounds like a winner. I do love a good Agatha and this is a good one and not one that's super well known! Thanks for visiting! I agree, it sounds like she desperately needs his love... perhaps revealing some insecurity. I'm curious to know more. Hope you're enjoying the book and have a happy weekend! I've read this book at least 3 times and never really thought of it from Rosemary's perspective. It's so fun to have a different way of thinking about a book I've read so many times! Have a great weekend! I'd like to know the back-story behind Rosemary. I love Agatha Christie! I own almost all her novels!! Oh yay! I love meeting other Agatha fans! This is a particularly good one! Oooh I definitely want to know more. Great teasers! Check out my Friday 56. Thanks! It's a particularly good one. Thanks for visiting! You must read this one! It's one of my favorites! Ooo! I love a good locked room type mystery! Me too. I'm not sure anyone does them as well as Agatha! I still haven't read any Agatha Christie but this sounds promising. This is a good one! The twists are great and the premise is brilliant. Happy reading!